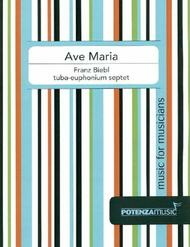 Ave Maria composed by Franz Biebl (1906-). Arranged by Mark Jenkins. For Tuba-Euphonium Septet. Chamber music. Published by Potenza Music (P2.90016).Franz Biebl (1906 - 2001) was born in Pursruck, Germany. For many years, Biebl spent his career as a professor of choral music at the Mozarteum Academy in Salzburg, Austria as well as serving as choirmaster and organist at many prominent churches throughout Germany. His beautiful Ave Maria, originally for men's combined trio and quartet, was written in 1964 for a local amateur firemen's choir competition near Munich. Since that time, American choirs have made the piece very popular in the U.S. The lyrics follow the Angelus liturgy about the Virgin Mary. This arrangement is for tuba-euphonium septet and was arranged by Mark Jenkins. Ave Maria composed by Franz Schubert (1797-1828). Arranged by Victoria Jicha. For flute quartet. Sacred. Grade 3. Duration 4:07. 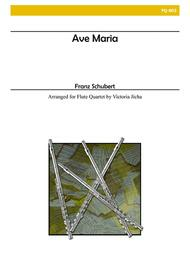 Published by Music Makers, Inc. (AY.FQ-803).Arranged for 2 C flutes, alto flute, and bass flute (optional C flute part included for alto), this beautiful arrangement could easily be adapted for a full flute choir. For recording, see item number R-24. Ave Maria composed by Franz Schubert (1797-1828). Arranged by Gale. For Brass Quintet. Score and parts. Published by Music Express (EX.EC537).About Digital Print Sheet MusicDigital Print is printable sheet music available anytime, anywhere. Just purchase, print and play! View your online sheet music at home, school, work or anywhere you have a computer connected to the Internet. Use our iPad app to view your digital sheet music on the go. With Digital Print, you can print your digital sheet music immediately after purchase, or wait until its convenient. And our software installation is easy - we'll guide you through the simple steps to make sure you have Adobe Flash Player, Adobe AIR and the Sheet Music Plus AIR application. Ave Maria composed by Michael Haydn (1737-1806). Edited by Charles H. Sherman. For SATB choir, 2 clarinos/trumpets, [timpani], 2 violins, basso continuo. This edition: Paperbound. E-Dur (E major). 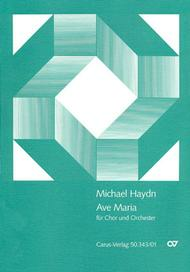 German title: Ave Maria in E MH 388. Feasts of the Blessed Virgin Mary, Hymns in praise of the Virgin Mary. Level 2. Full score. Language: Latin. Composed 1784. MH 382. 12 pages. Duration 3 minutes. Published by Carus Verlag (CA.5034300).ISBN M-007-08123-2. With Language: Latin. Feasts of the Blessed Virgin Mary, Hymns in praise of the Virgin Mary. Ave Maria composed by Franz Schubert (1797-1828). 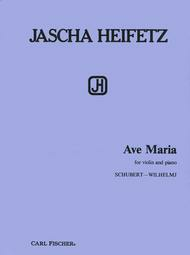 Edited by Jascha Heifetz. For Violin, Piano. Classical. Solo part with piano reduction. Standard notation. 7 pages. Published by Carl Fischer (CF.B2433).ISBN 9780825828171. With standard notation. Classical. Ave Maria composed by Franz Schubert (1797-1828). Arranged by Eric Vireton. Bb Clarinet Solo and Piano accompaniment. 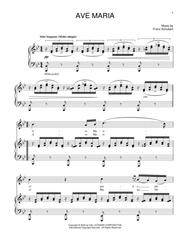 For Bb Clarinet solo and Piano. Classical, Chamber Music. Grade 3. Score and set of parts. 4 pages (score); 1 pages (parts). 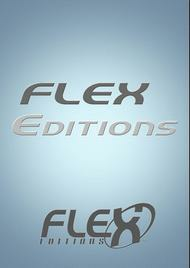 Published by FLEX Editions (FL.FX071049). 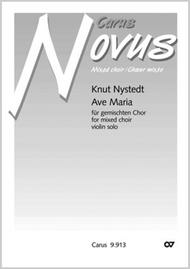 Ave Maria composed by Knut Nystedt (1915-). For SATB Choir, Violin. Contemporary choral music. 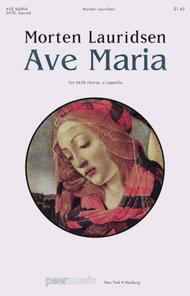 German title: Ave Maria. Contemporary choral music; Feasts of the Blessed Virgin Mary, Hymns in praise of the Virgin Mary. Full score. Language: Latin. Op. 110. 12 pages. Duration 13 minutes. Published by Carus Verlag (CA.991300).With Language: Latin. Contemporary choral music; Feasts of the Blessed Virgin Mary, Hymns in praise of the Virgin Mary.In his Ave Maria Nystedt has followed tradition by setting the original words of the prayer to Mary. He has adopted the unusual form of a violin concerto, with the choir replacing the orchestra as the violin's partner. In a sort of neo-romantic tonal language the choir joins in a dialogue with what is perhaps the most songlike of all instruments, the violin, which in accordance with the classical-romantic tradition even has a solo cadenza. Repeatedly, in addition to this dialogue, a wonderful blending of the sound of violin and choir occurs in which the choir employs primarily chordal sounds of an enriched tonality; but often it also uses pure major and minor chords to express the profound moments of the prayer. Ave Maria by Beyonce. For piano, voice and guitar (chords only). Pop. Piano/Vocal/Guitar. 6 pages. 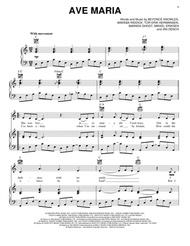 Published by Hal Leonard - Digital Sheet Music (HX.148216).About Digital Print Sheet MusicDigital Print is printable sheet music available anytime, anywhere. Just purchase, print and play! View your online sheet music at home, school, work or anywhere you have a computer connected to the Internet. Use our iPad app to view your digital sheet music on the go. With Digital Print, you can print your digital sheet music immediately after purchase, or wait until its convenient. And our software installation is easy - we'll guide you through the simple steps to make sure you have Adobe Flash Player, Adobe AIR and the Sheet Music Plus AIR application. Ave Maria composed by Franz Schubert (1797-1828). Arranged by Sharon Elery Rogers. For handbells (2-3 octaves) / handchimes (2-3 octaves). Christmas, General, Sacred. Level 1+. Handbell score. 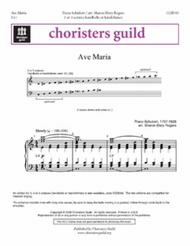 Published by Chorister's Guild (LO.CGB595).Level 1+ - This beloved, hauntingly beautiful piece is published in two compatible and accessible editions for handbells or handchimes. The piece contains solid block chords with few accidentals and makes use of easy bell techniques, such as LV, shake, and vibrato. It teaches dynamic contrasts, various simple tempo changes, and is a good piece to introduce voice-leading lines through balancing the melody against the continuous quarter-note pattern of the accompaniment. 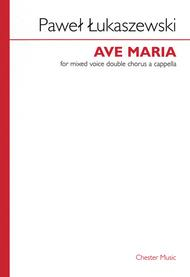 Ave Maria (Mixed Voice Double Chorus a cappella). Composed by Pawel Lukaszewski. For Choral (SATB). Music Sales America. 8 pages. Chester Music #CH75207. Published by Chester Music (HL.14019534).This piece for double choir (which has a companion Ave maris stella devised for separate performance) is grounded in traditional harmonic progression. An astonishing build-up of devotional intensity is achieved with near-exclusive reference to the notes of the G major diatonic scale. At the pinnacle of the piece an electrifying F natural is introduced, which, in combination with an A minor triad, replicates the climactic chord from the development section of the opening movement of Beethoven's 3rd (“Eroica”) Symphony. The “Eroica chord” has iconic status in Polish music, playing a major role in the final movement of Górecki's famed Symphony No. 3 (the “Symphony of Sorrowful Songs”). 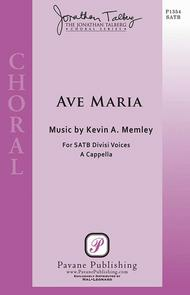 Ave Maria (SATB). Composed by Javier Busto (1949-). For Choral (SATB). Walton Choral. 8 pages. Walton Music #WGK122. Published by Walton Music (HL.8500076).The beautiful choral writing of Javier Busto speaks to the heart. His “Ave Maria” is one of the great works, which permits a choir to perform to the fullest, emotionally as well as technically. A fine choice for a festival program. Available: SATB. Ave Maria (The Jonathan Talberg Choral Series). Composed by Kevin A. Memley. For Choral (SSAATTBB A Cappella). Pavane Sacred. 16 pages. Pavane Publishing #P1354. Published by Pavane Publishing (HL.8301855).This is a beautiful piece in melody and form, but what stands out even more is how composer Kevin Memley has used the voice to orchestrate the piece. Programmatic effects are tastefully incorporated into the musical structure of the composition. Ave Maria composed by Franz Schubert (1797-1828). Arranged by Kirby Shaw. For Choral (SSA). Choral. 12 pages. 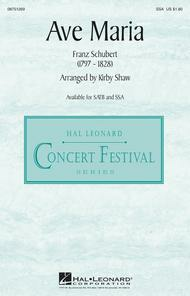 Published by Hal Leonard (HL.8751269).The lyrical addition of a flute obbligato brings added warmth and expression to this beloved Schubert classic, now also available in an SSA voicing. Available separately: SATB, SSA. Duration: ca. 5:45. Ave Maria by Franz Schubert. For piano, voice, and guitar (chords only). Christian; Classical; Love; Wedding. PV. 4 pages. 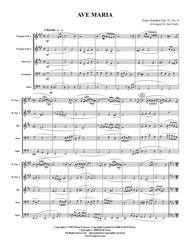 Published by Hal Leonard - Digital Sheet Music (HX.3593).About Digital Print Sheet MusicDigital Print is printable sheet music available anytime, anywhere. Just purchase, print and play! View your online sheet music at home, school, work or anywhere you have a computer connected to the Internet. Use our iPad app to view your digital sheet music on the go. With Digital Print, you can print your digital sheet music immediately after purchase, or wait until its convenient. And our software installation is easy - we'll guide you through the simple steps to make sure you have Adobe Flash Player, Adobe AIR and the Sheet Music Plus AIR application. Ave Maria composed by Morten Lauridsen (1943-). For Choral (SATB). Peermusic Classical. 12 pages. Peermusic #61919-121. Published by Peermusic (HL.228870).Ave Maria, one of Lauridsen's growing series of a cappella motets on well-known Latin texts, received its world premiere performance by the Los Angeles Master Chorale, conducted by Paul Salamunovich. The composer wrote, “This serene setting was specially composed as a 70th birthday gift to Maestro Salamunovich, who continues to enrich us all through his magnificent and enduring contributions to the art of choral music.” The changing moods of the text's two verses are reflected in a pair of strong and evocative themes, and in polyphonic textures enriched with divisis to eight or more parts, and peppered with the composer's trademark “gentle” dissonances.-- Peter Rutenburg, RCM Records. 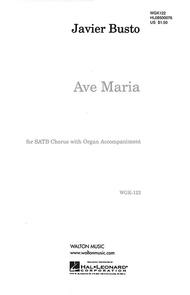 Ave Maria edited by and arr. Patrick M. Liebergen. Choir Sacred. For Opt. 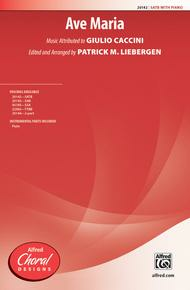 Flute (SATB choir). Choral Octavo; Masterworks. Choral Designs. Baroque; Masterwork Arrangement; Renaissance; Sacred. Choral Octavo. 12 pages. Published by Alfred Music (AP.20142).This haunting melody has been recorded by everyone from Charlotte Church to Andrea Bocelli and no wonder: it's gorgeous. And the harmonies are lush, and unexpected for a 16th century piece. The voice writing is straightforward, with no surprises; Patrick Liebergen lets the beautiful melody and harmonies speak for themselves. The piano accompaniment is supportive and an optional flute part is included. The Ave Maria text makes it appropriate for school or church use, year round.Inst. Parts Available (choral).About Alfred Choral DesignsThe Alfred Choral Designs Series provides student and adult choirs with a variety of secular choral music that is useful, practical, educationally appropriate, and a pleasure to sing. To that end, the Choral Designs series features original works, folk song settings, spiritual arrangements, choral masterworks, and holiday selections suitable for use in concerts, festivals, and contests.